A: I was born in the Netherlands in 1978. When I was just a kid I got my first computer, a commodore and later on an amiga. On the commodore I was annoyed by the bad games and started programming my own games. I ran into the limitations of sprites, and the amiga was my first true computer I started making graphics on. At age 15 I started with 3ds Max r4, and now I use a whole variety of software. A: Mainly work, I have so little time for personal art, I miss that freedom from time to time. But I enjoy working on major projects true our company D&D Creations which I founded with my partner Drea Horvath. A: I was trained in digital audio and video engineering in Rotterdam, the Netherlands. But the best lessons came from real world experience and working under high pressure. A: Vue xStream 2015, 3ds Max 2015 Design, V-Ray, Adobe Creative cloud, Geoglyph, Helios, Houdini, Sonar Platinum. A: My first introduction to xfrog plants came from my partner Drea, I was amazed how her plants looked so nice close up to the camera. 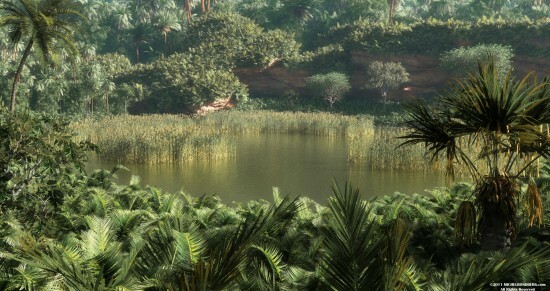 A: I enjoy both making plants, but especially creating large scale realistic ecosystems. A: Global Wind for Vue and an editor for 3ds Max. Also I would love to have full geometry models. A: A collection based on the flora in The Netherlands. A: Large library, no copyright lock, flows easy through a pipeline, editable. A: More dynamic functions, like LOD, progressive quality, and like I mentioned before Wind. See more of Michel’s work at in our Gallery or at ddreations.eu. This entry was posted on Friday, January 1st, 2016 at 5:00 am	and is filed under Artist of the Month. You can follow any responses to this entry through the RSS 2.0 feed. You can leave a response, or trackback from your own site.